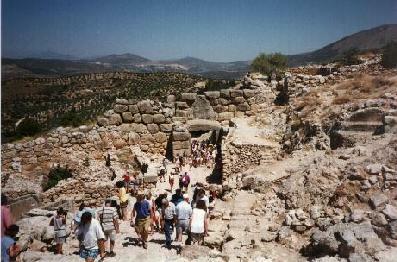 High above the modern town of Mycenae are the ruins of an ancient city state that was hailed by the same name. 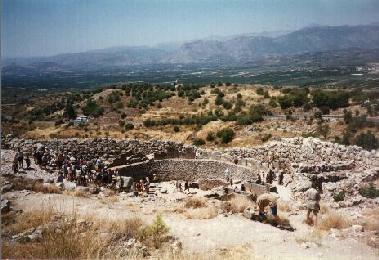 The ruins of Ancient Mycenae date back to the second millennium B.C. Though most of the original city state has been destroyed over time, parts of the Acropolis that overlooked a fertile plains still remain. The Acropolis sits atop an impressive mountain and is flanked on either side by taller mountains forming a very formidable fortification for the site, as well as a very scenic view (Something that I have noticed about a lot of the old Greek cities.) Impressive burial halls, dug into the mountain, also remain. 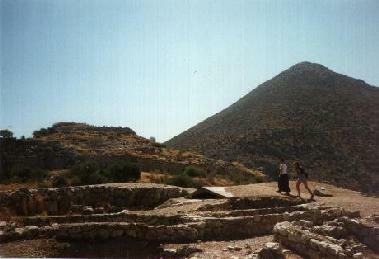 Mycenae was once a great city. They were one of the power houses in the days where city states such as Athens,Corinth, and Sparta controlled the region. The wealth that they obtained was enormous. The riches of kings were uncovered in the various burial sites. Many of those riches are on display in the Athens' Archaeological Museum. At one point the Mycenaens had control of the island of Crete which most likely aided in their control of the region. 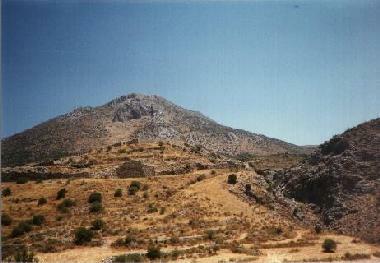 As I said above Mycenae is on a hill, with taller hills on all sides. You can see ruins of city walls, and the Acropolis above that. Not much is left now, but in its heyday the city was highly defensible. 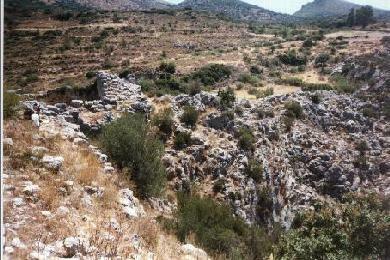 This is looking right down into the valley on the southern face of Mycenae. Quite hard to climb up. It also gives you an idea of what it looks like around the site. Second Circle of Royal tombs. The Lions Gate is the main entrance into the city. The lions, with their fore paws on an alter of some sort was suppose to represent the mycenaean's power. 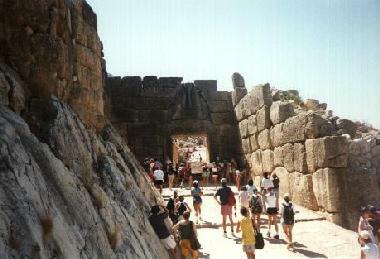 Anyone coming to the Acropolis would have to enter through these gates. Also notice the walls on the right hand side had the people walking by them. I'm amazed at how these things could have been moved. This is the "second" circle of royal tombs, located outside of the Acropolis. These tombs are thought to be older than the first circle of royal tombs (below). They were mostly shaft graves and provided Archaeologists with a lot of information about the city. What I find interesting is that I saw a buried structure (right center) like this in a set of Greek ruins in Italy. I wonder if this was just a style of houses or or the structure in Italy was a grave of some sort? This is looking back towards the Lions gate. There is a granary on the left hand side of the gate and I am not sure what is on the right. you can see the people marching in the city. There is a constant stream of people through these gates. This is the first circle of royal tombs. Which was discovered before any of the other tombs in the site. Eight men, nine Women and two children were found in these grave shafts (six in all) as well as thirty pounds of gold. All this gold led the early Archaeologists to think this was Agamemnon's grave, but later they found it dated much latter than when he was thought to have lived. I have a second picture on the next page to let you see into the graves.